Ok, there is one good thing about Restaurant Week – it’s the one time that Toro takes reservations. The rest of the year, Ken Oringer and Jaime Bissonnette make you wait (and wait and wait) for a coveted table at their tapas restaurant on Washington Street. Unfortunately, while Restaurant Week reservations take away the wait time, Restaurant Week service errs on the side of too attentive. Toro’s RW menu is a shortened version of their normal offering, but a far cry from the limited prix fixe found at most places. You can choose 1 “pincho” (1-2 bites each) per person, 5 “tapas” (small plates) for 2 people, and one small dessert each, your choice of churro with chocolate orange sauce or manchego cheese with membrillo pasta (get one of each and share with your date). For our pinchos we chose the tuna tartare with charred spring onions and pine nuts and the foie gras with grilled peaches. The tuna was lush and the pine nuts made a nice flavor and texture contrast, as did the peaches with the foie. 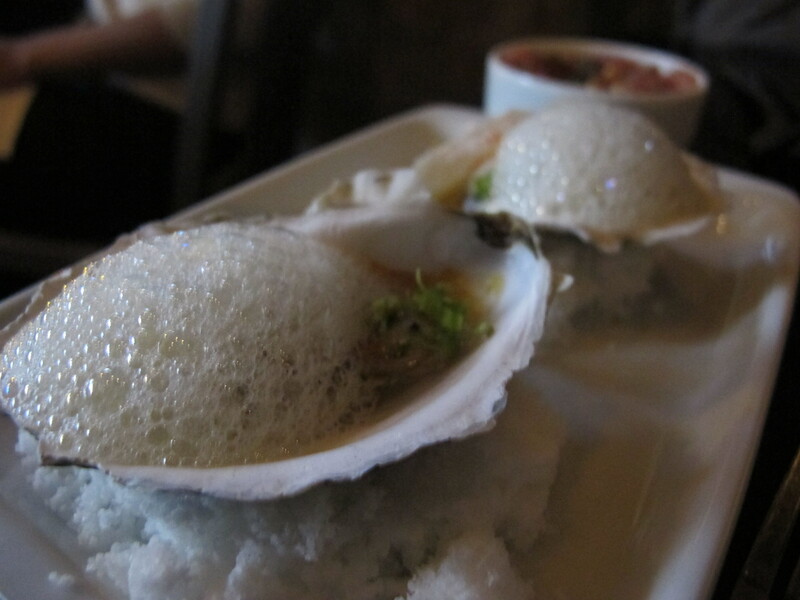 For tapas we started with Ostras en Escabeche – marinated oysters with grains of paradise, lovage, and citrus. One slippery mouthful each, but a perfect match of vinegar brine and bright acid. Next were Anna’s Empanadas, which would have been perfect had our plate not been whisked away with several bites left on it. It was at this point that I started to feel a real time pressure to my meal – if I didn’t jealously guard every mouthful (and race to finish my food) I’d lose it to the well-intentioned but rushed waitstaff. Our food, which I had hoped would come at well paced intervals, arrived in several clumps. While everything was delicious, we didn’t have time to savor anything. My empanada plate was snatched before I could sweep up the aioli. Our confit of pork belly was resting in a delicious sauce that disappeared when I went for a sip of wine. The amazing hamburguesas with smoked tomato and picked red onion were (thankfully) hand-held and thus safe, but by the time my favorite dish arrived – the Maiz Asado, grilled corn with aioli, lime, and aged cheese, I was wise to Toro’s game. I swept every last bit of sauce onto my spoon and held it in one hand while I munched my corn with the other. I wasn’t letting them get away with that sauce. So much for a languid Spanish dinner. Maybe on a normal week Toro doesn’t take reservations so they don’t have to rush you through your meal, but the crush of Restaurant Week forces them to aim for mass turnover. Maybe, but if that’s the case, then there really isn’t anything good about Restaurant Week, after all.